Kara kuzhambu is an aromatic, spicy and tasty kuzhambu. 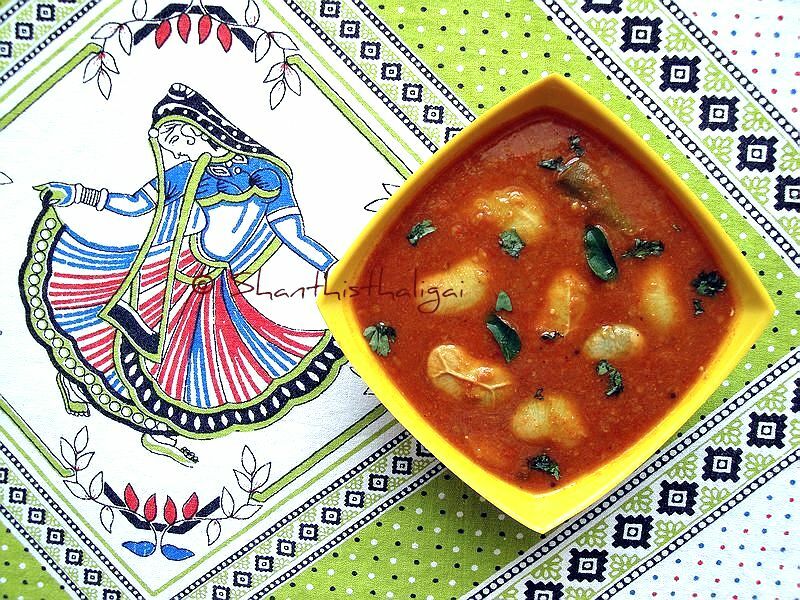 There are many variations, but this is an easy to make kara kuzhambu. Though it is made with shallots and garlic, mine is a No onion No garlic version. Those who use onion and garlic in their food can use it. Another version of vegetable kara kuzhambu can be seen here. Fennel seeds (Saunf) - 1/2 tsp. Fenugreek seeds - 1/8 tsp. Cook fresh double beans with little salt and water until soft. In a kadai, heat a spoon of oil and fry the items given in 'to grind', in the given order, and grind to a paste. Keep aside. In the same kadai, add a spoon of gingelly oil and temper with the given ingredients. Add turmeric, chilli and coriander powders give a quick saute without burning and add the tamarind extract and salt. Allow it to boil until the raw smell diffuses. Now add the cooked double beans and ground paste. Mix well, add water to get the desired consistency and allow it to boil until thick. Switch off the stove, add a spoon of gingelly oil to the kuzhambu and mix well. Double beans kara kuzhambu is ready. Tastes best when mixed with hot rice and a dollop of ghee. It can also be served with idli and dosa. NOTE: If you do not like saunf taste, garam masala can be used.